Good idea of substituting butter with applesauce. It'd be healthier too. Oh, how about using applesauce and adding pineapple as topping? It should be a wonderful combination. I really want to go for it. 梳打粉 (即Baking Soda) 只含Sodium Bicarbonate. 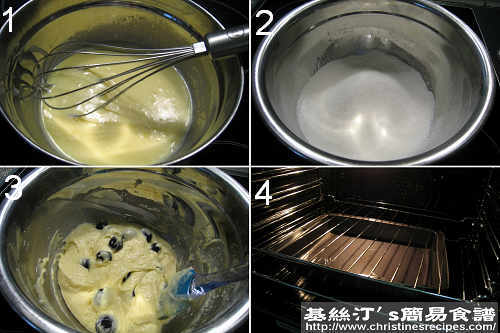 但泡打粉（即Baking Power） 不單內含Sodium Bicarbonate，還有 starch和Cream of Tartar. i follow your recipe to do this, but why got 粉味？Please help!! Probably your muffins were not cooked through yet. Please note that the temperature of each oven is quite different. Test your muffins with a needle. If it comes out clean, the muffins are done. If not, then bake a few minutes more until done. Am I suppose to warm up the milk before adding the butter and egg mixture? I didn't do it this time. After I added the mixture into the cold milk, the butter form into small lumps. Is it suppose to like that? Your mixture in picture #1 looked very smooth. Thanks for taking answer my question. It should not be any lumps in the mixture after adding the milk. The milk should be at room temperature at least if you don't warm it up so that all the ingredients are easily combined. Thank you so much for the great tip of baking muffins. It makes big different! Thanks! My kids are saying the blueberry is too sour. Shall I add more sugar or shall I marinate the blueberry with sugar overnight b/4 I bake? Pls advise. Thanks. Hmmm...the bluseberry should be very sweet. If yours are too sour, yeah, go ahead to mix some sugar with them. Let me know how they taste. Actually I did it twice. One time I mixed some sugar into blueberry overnight and other time I just double up the blueberry. There is not that much different even I marinated it overnight. Instead the double up of blueberry bring out more favor and my family like it. Especially the young kids. Again, thanks for the sharing the receipe! 鬆餅試了再告訴你,new zealand 不似香港那麼方便,隨時想做,即刻可下樓買材料,這裏要開車,11號行不到! 但買完東西,通通放上車,便開車回家,在港要一袋袋拿回家!! 有利也有弊!!嘻嘻! just wondering if you are using the fan mode for the oven? 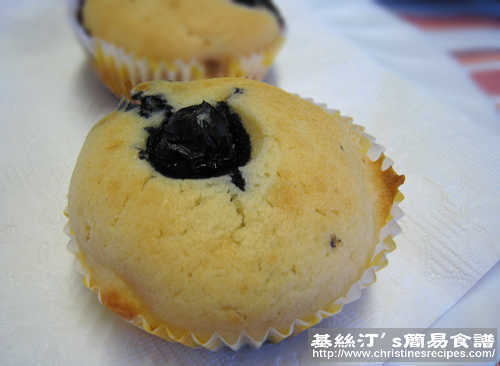 the shape of my muffins are not same as yours, the top 裂開了! thanks for all your hard work on this website. 我沒用 fan mode. 食譜提議的焗爐溫度是沒開 fan mode的。如果要用 fan mode, 要減低 20C. 我有時用 Coles 的，有時用 Aldi 的 plain flour. Hi Christine, I tried making the muffins twice but they still turn out dense and not fluffy. First time I think I over stirred. Second time I was already more careful and just mix enough then stopped. But it still turned out similar. Would it be the setting of my oven and the temp? I also used the fan mode but still 200C. Would this result in a dense muffin? How did your batter look like before baking? Was it very thick? 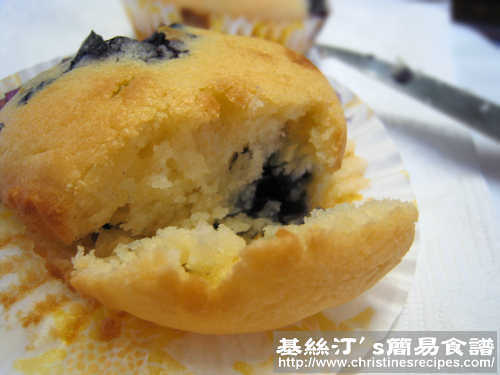 Btw, don't expect the texture of muffins feels like a chiffon cake. It should be heavier and thicker than a fluffy cake. Oh well, you might like to add more milk or water to loosen the batter a bit if you make some next time. It should be better. Hi Christine, can i subsitute the flour with low gluten flour? Sure, you can use low gluten flour/cake flour. 我整既muffin經常都係平面, 但斜埋一邊,唔係裂開, 而且訪邊還好像火山爆發咁, 係咁擁晒出黎旁邊, 令到個muffin變到細了. 是否加得太多泡打粉同埋個爐太熱? any expert suggestion to solve this problem ? The water bath method is to help the muffins retain more moist. And when you let your muffins cool down a bit, you can store in air-tight container. That helps too. 謝謝妳的食譜, 我試過做真的好好味! 我的女兒喜歡朱古力味, 如果不用blueberries改用cocoa powder可以嗎? 份量如何?